Goodenia ovata is a member of the Goodeniaceae family and is known as the Hop Goodenia. There are 170 Goodenia species with only three occurring outside Australia. The Hop Goodenia comes in a number of guises. Plants may be an upright or spreading shrub that will reach a height of two metres. There are also ground covering forms. One is known as “Gold Cover”. The leaves are glossy green, oval in shape with a toothed margin. 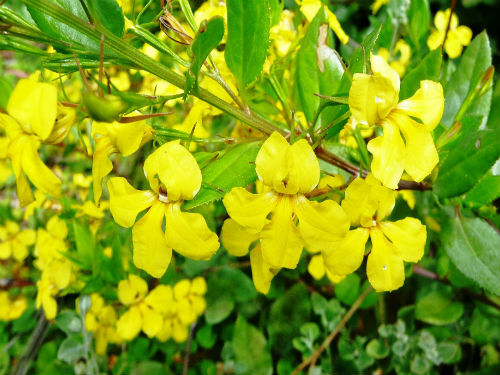 The flowers are bright yellow and held in the leaf axils and are conspicious against the foliage. Flowering extends from October to March with some flowers carried at other times. The upright forms tend to become a trifle straggly so pruning is appreciated. The ground covering form could be tip pruned to increase the foliage density. The Hop Goodenia is a widespread species and is found in all the eastern states including Tasmania as well as South Australia. Goodenia ovata is a cheerful plant with its bright golden flowers. Scattering specimens throughout the garden will bring a spring feel to your domestic landscape throughout the year. An upright form was introduced into England in 1793. G. ovata is one of the easiest native plants to propagate from cuttings.